Recently purchased and ready to build. 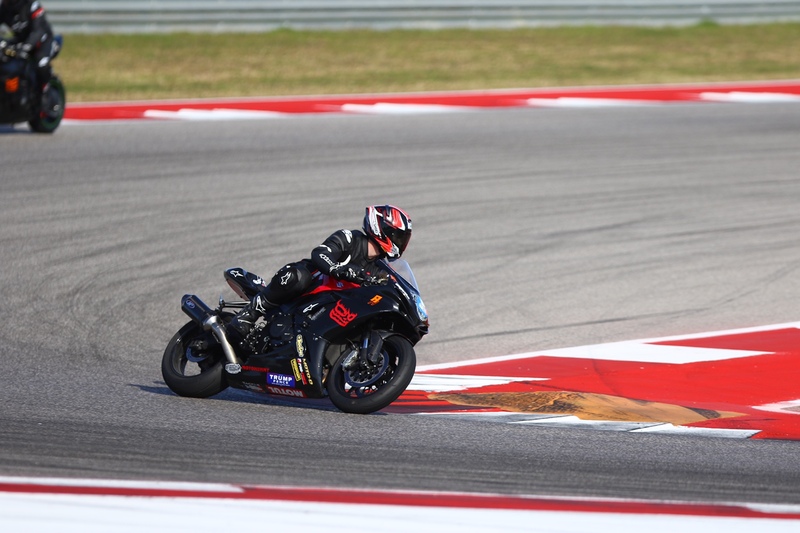 I’ve owned a 2004 gsxr 600, then a 2007 gsxr 1000, and then a 2013 gsxr 600 and now I’m going track only with the Honda. I’m using this post to keep me honest on my intentions and to track the progress and hopefully others can benefit as well. If you see anything you want better pictures of or clarification on, feel free to ask. 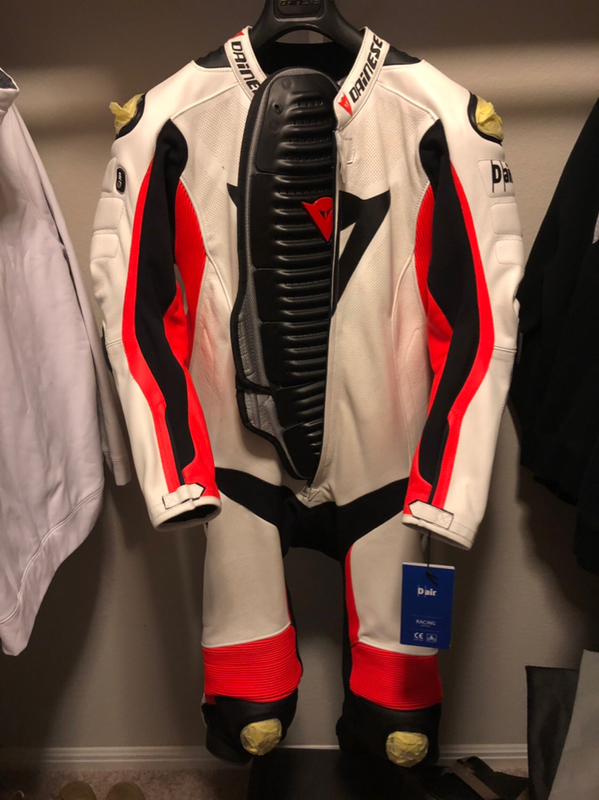 Fortunately I live in a north suburb of Austin, TX and have Motomummy.com warehouse 4 minutes from my house, and that’s where my loyalty lies. When I purchased this bike, it came with stock Rearsets, 520 conversion driven sprockets stock from +3 rear, Vance Hines dented scratches slip on, zero gravity corsa, front rear axle sliders with frame sliders, motion pro rev2 50mm, ignition delete, stock master, kn filter, and armor bodies superbike that was not sanded or primed and just cheap rattle can paint with hundreds of stickers all over it. I think that’s it for what it came with, next is the plan. 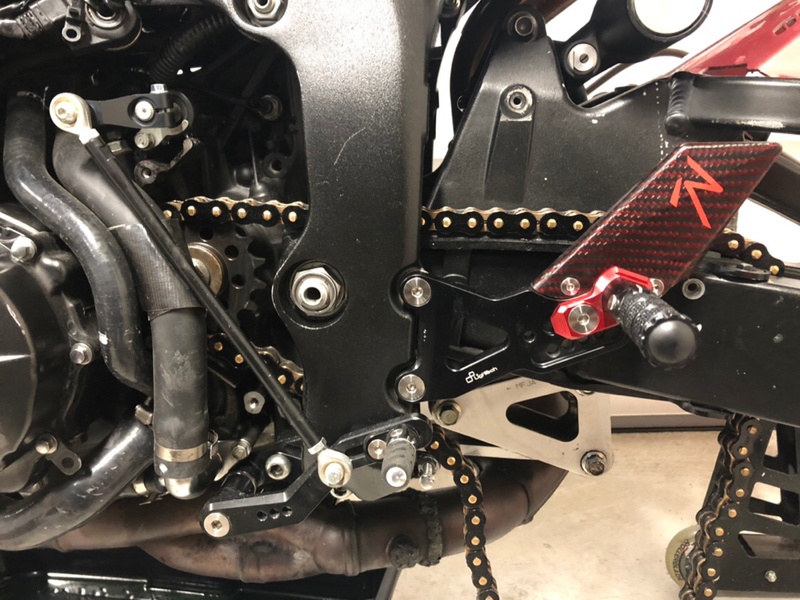 I have installed lightech Rearsets and switched to gp shift. Exhaust is staying the same as I will upgrade to a full once I feel I’m capable of riding to NEED the additional power. Plan to add Translogic Quickshifter. 43 tooth (+1) rear sprocket. Powder coat rims red and add 90* stems. Q4 tires which I’m aware of the mileage you get here, but 900 miles is easily a full season of riding. Case covers. Gear indicator. 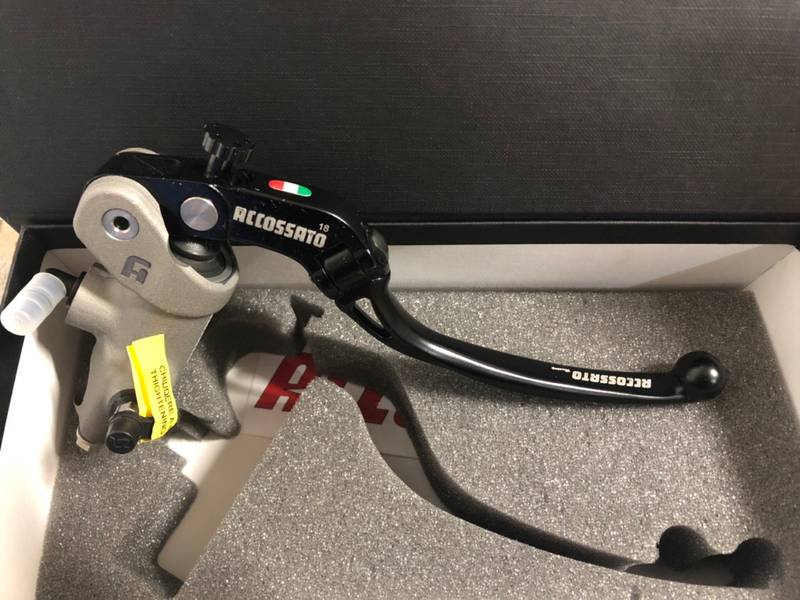 Brembo master but I had the accossato and liked it so either one. 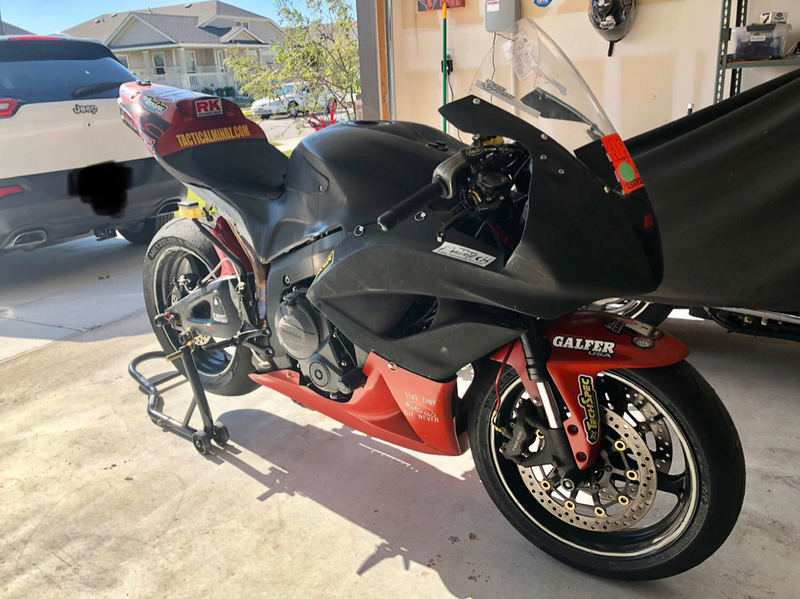 I have some things to fix because it was a track bike and things were neglected but as they happen I’ll continue post. Thanks for following along, hopefully this turns out fun. So removed the lower, tail, and windscreen along with a ton of stickers. 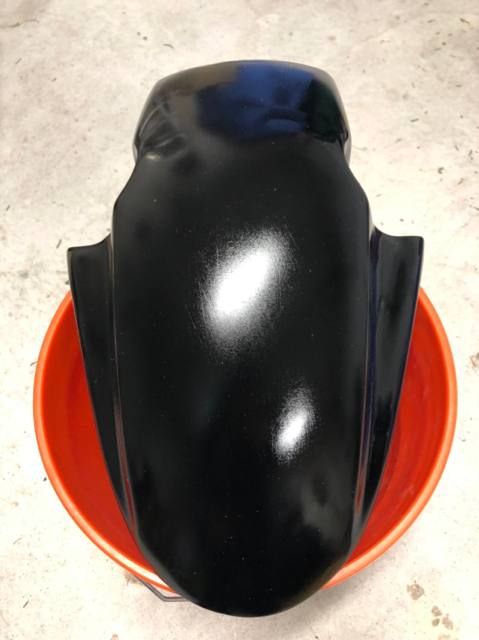 I’ve been using goo gone and the pain comes right off, but only getting off the nose has destroyed one towel so sanding is option 2. Removed rims and took off rim tape. Once they are all done I’ll be adding the master and bleeding the brakes with rbf600 to fill them. Also next up is oil and filter change since I don’t know the history very well. The previous one to torque front and rear axle and sprocket nuts had them over 200lbs and was close to need a breaker bar. Crazy. Keep 'em coming! Watching with Interest... Some heavy duty lifts you got there! Did you say goo-gone removes the paint? If your painting anyway, may as well remove residue with mineral spirits /paint thinner. I think WD40 works good too. Last edited by Wazoo; 11-01-2018 at 02:56 PM. Fully stripped now. Just waiting for mid month to get the parts and have the time for install. Until then my only agenda is to take the paint off and sand to prep for paint. So won’t have much to show until then, but as soon as I get new goodies or make progress towards something interesting I will post it. Thanks for following and bare in mind this is my time of learning the Honda as well..I’ve been Suzuki my entire life. Last edited by marc.adamski; 11-02-2018 at 09:26 AM. Looking good man. Ill be watching for progress. I love to watch bikes come together. Shoutout Motomummy for the hook up on the D-Air. Prices are insane right now. 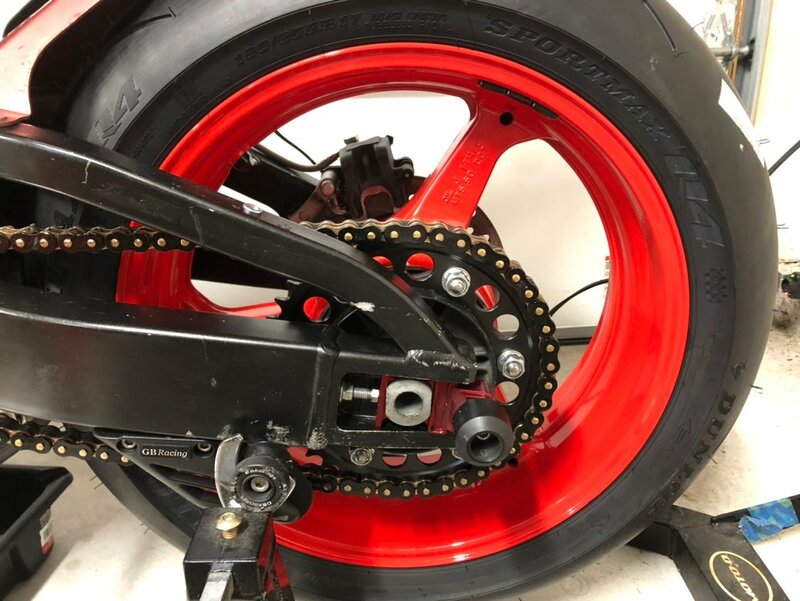 I also had them knock off the tires and prep the rims for powder coat and they are getting done I’m racer red by enigma coatings and should be done next week and getting new bearings and debating on captive spacers. I have sanded down down the entire tail and prepped for paint, just have to do everything else. I’m ballin on a budget so I’m doing it all in the limited free time I have while maintaining a career, marriage, college, and minimal social life. Thanks for keeping me on track, this forum is literally doing it for me. 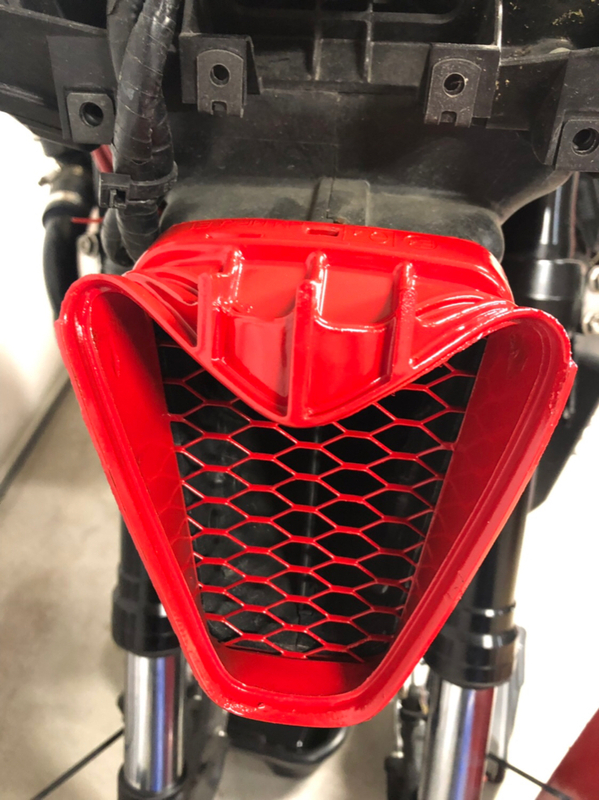 I also have ordered a front reservoir with bracket from a 2012 off eBay which should be here tomorrow along with a gear indicator. This weekend my dark smoke visor will be delivered as well for the bell race star. Nice suit man! Wheels sound like they will be very cool! Hey man, Looking good. Did you order a pc3 new or find a used one. I have a pc3, ignition module and quick shifter I sell you if you want. Its a pull type quick shifter. Also there is a aftermarket damper for sale on the wera forums. I bought the dudes swingarm and forks with the ktech cartridges just last week. I am racing an 07 so can give you a lot of info if you need it. I wouldnt run the stock damper. I wasnt impressed with it so put a GPR on mine. I also have an 04 Ill be racing in modern vintage this year that is getting an 07 front end, forks, wheel brakes ect. Let me know if you have any questions. The bike is coming along nicely! I am following these threads as I might stop riding street and switch the bike over to track only. Wheels are done, now off to get new bearings and the Q4s mounted. I got my back ordered 43 tooth sprocket and the translogic QS in yesterday. Just need to find time between work and school to install the master and then bleed brakes and start with the installs. Woooooooo! Q4s look good and the wheels are dope. Hopefully will have the entire bodywork complete by next weekend. I have the tank mounted and it’s good but missed a few spots on the lower I need to touch up. 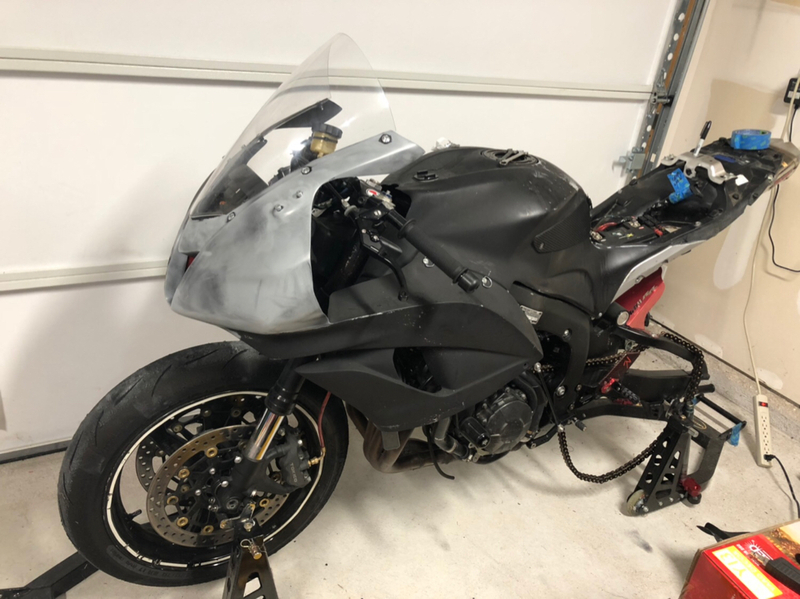 Still have to mount front wheel and do brakes MC and everything and I may have a leaking fork cap I just found but I’ll see how that turns out after watching it a couple days. 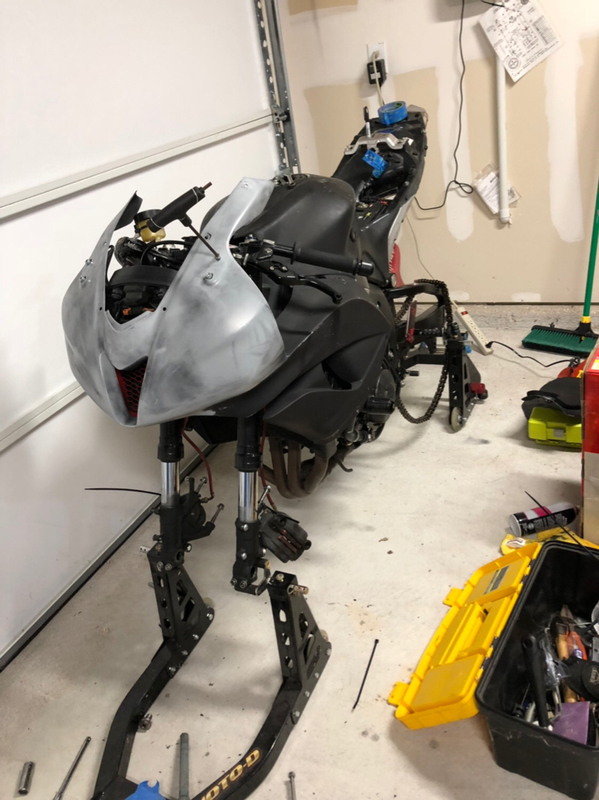 Will update after front wheel is mounted! Wheels look good from here! Are they as good looking up close and personal? How much $$ was it to powder coat them? I would have preferred they were a bit more red but I chose the option ‘racer red’ and I guess it has a slight orange tint. I’m not mad about it though they look really good. Cost was $200 plus tax. 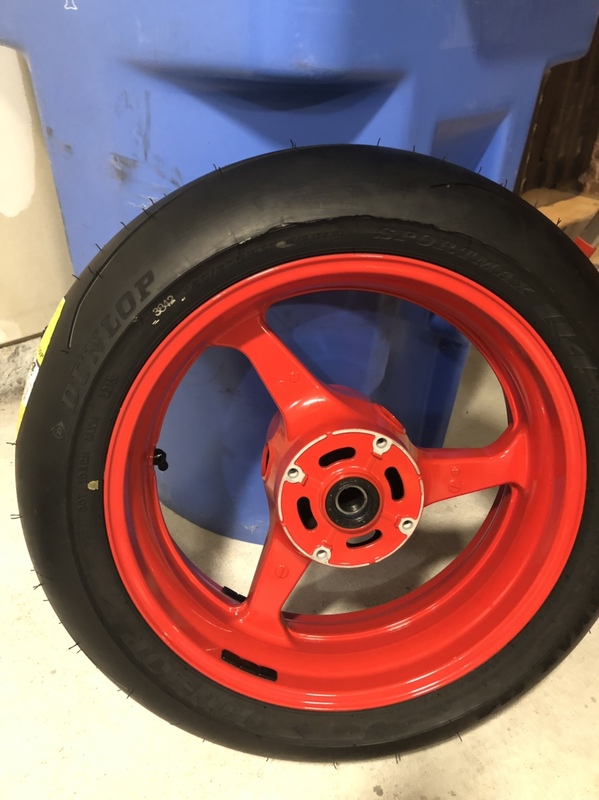 I’m definitely pleased with the outcome and there was a bunch of deep scratches all over both sides from gravel traps sooooo this is like having brand new wheels! Seems reasonable for "brand new" wheels! Looks great! Colors all have subtleties. Hard to get it right unless you have it right in front of you. Sometimes they'll need base coats to produce the colors (you're expecting) as well. 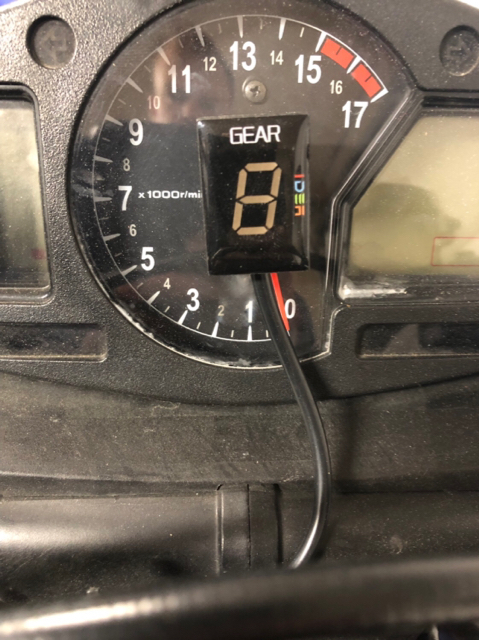 What kind of gear indicator is that? I didn't like Q3s so I'm excited to hear your thoughts on the Q4.